This week, Google revealed a data breach on it’s Google+ social network that uncovered private data for up to 500,000 of its users. The Wall Street Journal broke the story Monday and reported that Google feared making the breach public because of growing public distrust in the technology industry’s privacy policies and growing regulatory scrutiny from many governments worldwide. While the data breach did not affect nearly as many users as the Cambridge Analytica incident during the 2016 U.S. presidential election on Facebook or the revealing of data for over 87 million Facebook users earlier this year from a software glitch on public profiles, this data breach has far-reaching implications for how we interact with one another online and what types of data is collected using these “free” services. Does this affect my personal data? It’s currently unclear how individual users’ data has been exposed or how it may affect you. Google has said that 438 applications may have used this API (i.e., a server tool that allows software to complete an action—such as collecting data—without leaving a website). Because Google+ API’s log data is only stored for two weeks, they are unable to determine how long the problem was occuring. But the company claims no evidence has been found that any personal data was misused. How do social media platforms track and collect our data? Social media platforms are designed so that almost every action you take is tracked, collected, and analyzed. The words you use in writing posts or tweets, the photos you upload, the causes you like all tell the platform about your interests. For example, on Facebook when you click “like” on a brand or company, that information is used to create a consumer profile that can be used to predict your purchasing behavior. Rather than paying for these social media services with currency, users pay for these “free” platforms with their user-generated data. This data is then being sold to market products and services to us. How much data is stored through these online services? The amount of data being collected and stored on social media platforms is staggering because the number of social media users is astronomical. About three billion people—approximately half the population of Earth—uses social media, and new users are increasing at a rate of more than one million per day—an average of 14 new users every second. 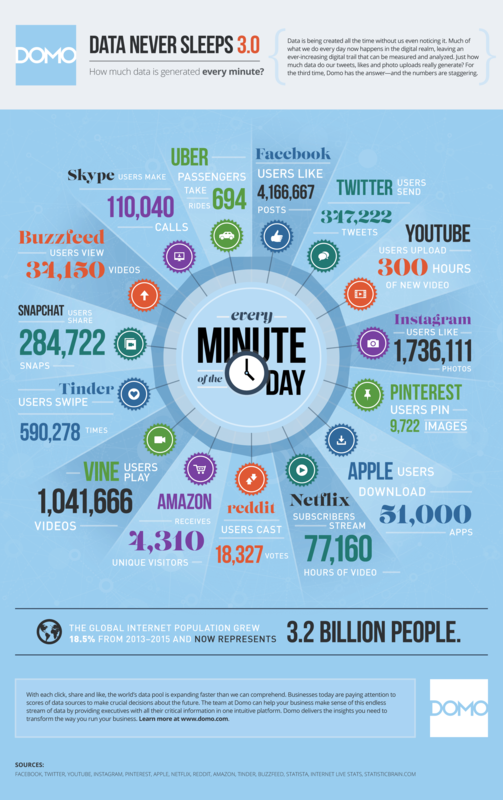 Every minute on Facebook users post 510,000 comments, update 293,000 statuses, and upload 136,000 photos. Additionally, Facebook users click the “like” button on more than four million posts every minute. Instagram users post 46,740 pictures every minute, while Twitter users post 656 million tweets per day. There are also more than four million hours of content uploaded to Youtube every day, with users watching 5.97 billion hours of Youtube videos each day. The sheer amount of data being collected about you is staggering and leads many to question how this data will be used by marketers and third parties. Why does this privacy issue matter? Concern about privacy online is growing at an exponential rate, but some have questioned the seriousness of data collection under the banner that they have nothing to hide from a watching world. Christians need to know that nothing we have ever thought or done will escape God. But while God knows everything about us, he still loves us. God doesn’t seek to know us in order to meet a bottom line as marketers do when they collect our data. He seeks to know us because of his great love, shown to us in the person and work of his own Son. We cannot hide anything from him, and that is for our good. But that doesn't mean that we should open up our private data for anyone to view online. Prudence demands caution, given the unknowns of who might have access to our data and how it might be used without our knowledge. It is yet to be known how this type of data will be used outside of simple marketing campaigns and online ads. With the rise of AI and algorithms, the ability for people to know the deeper details of our lives without asking us directly is alarming. This type of data has already been used to sway the outcomes of elections and will increasingly be used to motivate human behavior in ways that should make us uncomfortable. How do I protect my privacy on social media platforms? Any use of social media platforms can potentially expose your personal information. But there are several steps you can take to secure your data and minimize invasions of your privacy. Limit the amount of information you provide in your profile: Sites like Facebook make it easy for users to “overshare” their personal information. For example, there is probably no reason for an individual to include their phone number or personal email address on their social media profile. People who need that info likely already have it. And if they don’t, they can contact you through the platform. Don’t use social media logins to log for other sites: Many websites and apps make it possible for users to log in using Facebook or Google. While this is convenient, it may increase the sites that can expose your social media data. Limit who can see your social media activity: With some simple changes in settings, you can make your data much more secure. To discover all that Facebook knows about you, go to “Settings” and select "Download a copy of your Facebook data,” then "Download Archive." When the file is ready, choose "Download Archive" again, and a file will download to your computer. Browse through that archive by opening each file inside the folder. On Twitter: Choose “Settings and privacy” to make any necessary changes. On Google+: Go to “Home,” then “Settings,” and make any necessary changes such as who can interact with you. You can also download a copy of the data that Google has for you. To do that, go to here, and select the products that you want to download. Click 'Next' at the bottom of the page, and choose a file format. Select your delivery method (via link, email, etc. ), and choose "Create Archive."